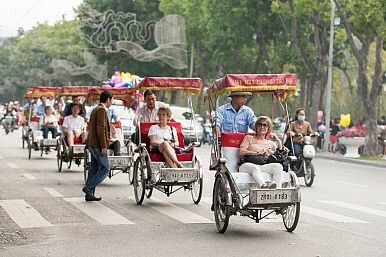 After a worrying drop in tourism numbers, some European visitors will find it easier to enter Vietnam. Vietnam’s decision to axe visa restrictions on five European countries is expected to be extended in a bid to shore up its tourism industry, which has been punished by a military standoff with China and a sharp deterioration in the Russian economy. The move also underscored Hanoi’s desire to compete with more established tourist markets within ASEAN, like Thailand, Cambodia, Indonesia and Malaysia, in attracting tourists from the lucrative European market. More than eight million foreigners landed in Vietnam in 2014 but in the first five months of this year those arrivals were down a worrying 13 percent to 3.3 million, in a country which generates about six percent of its annual GDP through tourism. Russian tourists were down 16 percent on the back of a collapse in the ruble. European arrivals fell seven percent and Chinese numbers plumbed 30 percent which was attributed to the military standoff Vietnam endured this time last year amid overlapping claims with Beijing in the South China Sea, particularly around the Paracel Islands. Tensions have calmed this year despite Chinese construction of military barracks and massive landfills on the disputed shoals and atolls. The Vietnamese economy is also struggling to recover from a nasty downturn, experienced after years of excessive debt and corruption marked by the spectacular collapse of state-run enterprises and the jailing of senior bankers. It is expected to grow by six percent this calendar year. “This is certainly very good news for Vietnam’s tourism industry,” Nguyen Van Tuan, General Director of the Vietnam National Administration of Tourism, said. From July 1 tourists from Britain, Germany, France, Italy and Spain will be allowed visa free stays for up to 15 days. A standard tourist visa is priced at $45 but travellers have often complained of additional amounts being added on, with total visa costs sometimes exceeding $100. An average cost of $70 a visa produces about $11 million in revenue a year for state coffers. Reciprocal visa exemptions already exist for the nine other countries in the Association of Southeast Asian Nations (ASEAN), along with Russia, Belarus, Japan, South Korea, and the four Nordic countries. Tour operators also want the visa exemption extended to 30 days and all important markets including EU countries and members of the Trans-Pacific Partnership (TPP) included, which would add Australia, Canada, Chile, Mexico, New Zealand, Peru, and the United States to the list. The waiver came after Vu The Binh, deputy chairman of the Vietnam Tourism Association (VITA), called on the government to cancel visa fees for all international tourists for the second half of this year. This will also speed-up customs procedures and end complaints from European tourists who often balk at extending a holiday from Thailand into Vietnam because of the stringent visa rules. Vietnam, a one party-communist state, has strictly enforced a tight visa policy and imposed restrictions on the movement of people for decades but this was temporarily relaxed in late 2009 when tourist arrival numbers were falling sharply and visa fees were waived in response. “The visa fee waiver then benefited more than 100,000 international holidaymakers and the arrival numbers surged 36 percent in 2010,” Binh said. Kenneth Atkinson, representative of Vietnam-based tourist groups had also agitated for an end to those policies, arguing it did not matter how attractive a destination was if inconvenient visa policies were acting as a deterrent. “No matter how strong and interesting the promotion campaigns are, tourists still face difficulty in accessing the country because of its visa policy,” he told local media. Vietnam's most popular tourist attractions are being degraded. What can tour companies do to help?